The VM & Display Show is held at the Business Design Centre in Islington, London and is the longest-running exhibition for the Visual Merchandising industry and David Anthony our new Creative Visual Merchandising Expert exhibited his freelance business in the Creative Network area of the show. As a consultant and creative visionary showcasing a lifestyle gallery look the modern simplicity of his stand brings to life his website David Anthony Creative with contemporary black and white branding, a digital photo screen installation and cool lifestyle furnishings all with an artistic edge. Portfolio images of his work slide across the screens and the total look of the stand instantly conveys the expertise and feeling that David offers the retail industry. 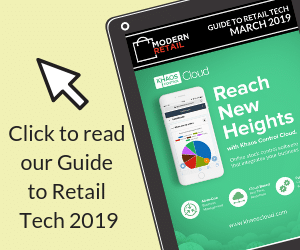 With nods to a social media and a blogging presence, these attributes captured the attention of Rob Gamage from Modern Retail with a view to future collaboration between the two. This will begin with a NEW Visual Merchandising blog on Modern Retail featuring independent retailers and the creativity that shines throughout London’s fresh, cosmopolitan and forward retail scene. The VM & Display Show is the place for all your visual merchandising and display needs, visitors can meet with an array of industry experts who can help make displays a reality from concept to installation discussing your visual merchandising and display requirements with experts in your field. The show provides exhibitors with the chance to present their expertise to the teams behind the high streets’ windows and in-store displays. The next show takes place on the 18-19th April 2018 covering everything within Visual Merchandising and Display from Mannequins, Print, Christmas Decorations, Display Services, Props, Design, Graphics, POS, Lighting, Fabrics and everything in between and is a great place to meet likeminded retailers and have a look behind the scenes as to how the industry works and meet suppliers who are at the forefront of the VM world. Specialising in Fashion and Homewares and the Café and Restaurant Lifestyle sectors; David will help you to capture your customer. He’ll visually and creatively make the most of your retail space, whilst maintaining your brand values and customer profile. David is a creative, spiritual, original and dynamic and has been a Visual Merchandiser for 30 years and is from the old school days of ‘window dressing’. He is London based although began his working life in Adelaide and Sydney, Australia and is well-travelled throughout the UK, Europe, USA, Canada, Asia and Africa. He is a Londoner at heart and loves its energy, opportunity and creativity. With a former background in department store and boutique fashion and homewares where he learnt the art of Visual Merchandising and Styling he then moved into the world of independent theatre and cable television designing sets alongside his retail experience before working with freelance clients. David creates spaces and identifies what’s not working and how to make your windows and in-store look great through the art of merchandising working from behind the scenes ensuring that everything is in place along the customer journey from front of house to operations as they intertwine offering a creative and inspiring environment to best serve your customer and bring your brand alive! His many years of expertise have also recently awarded him an Associate Member of the British Display Society and a Top 20 place for Visual Merchandising blogs and websites for Merchandisers worldwide by Feedspot, based on search and social media metrics. You can see David’s latest work on his website. Also stay tuned for the launch of the retail store images he captures, which will feature on Modern Retail UK.